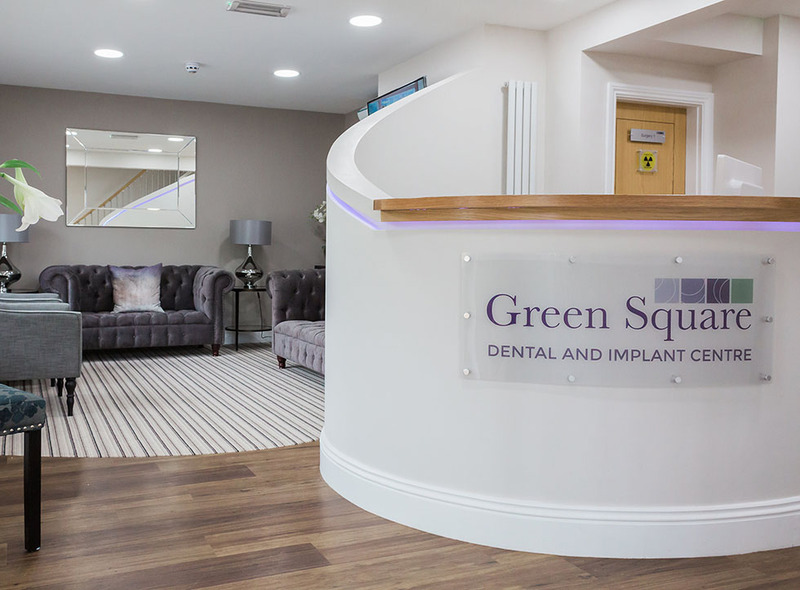 Here at Green Square Dental & Implant Centre in Rotherham, we transform smiles using a range of different treatments with natural looking results, from tooth whitening to missing teeth. 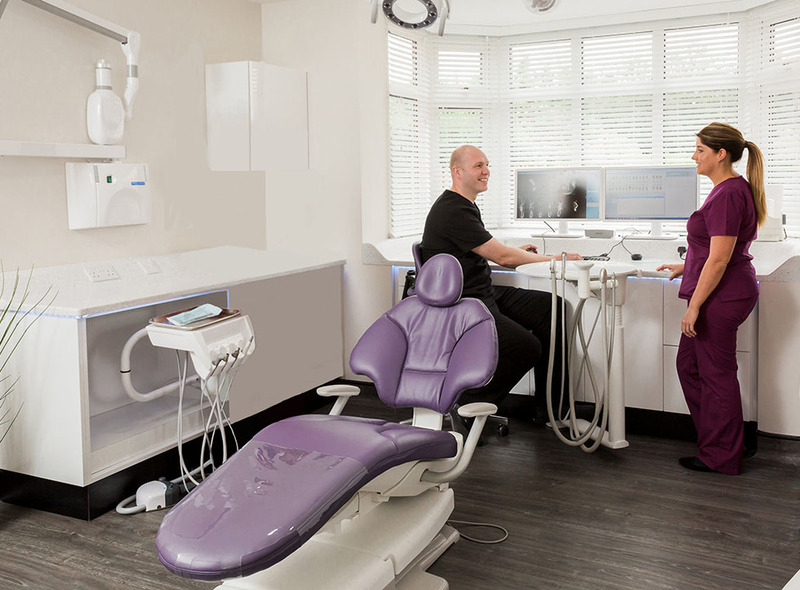 Our Principle Dentist Duncan Park is highly experienced in dental implants and has acquired a comprehensive portfolio of cases. 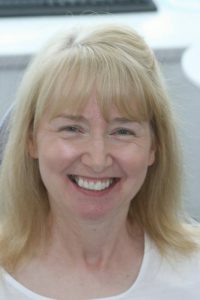 Have a look at our smile gallery for before and after images of dental implants and veneers from some of our happy patients. 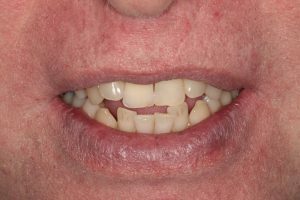 This patient initially came to the practice with a denture filling the missing upper front tooth space. 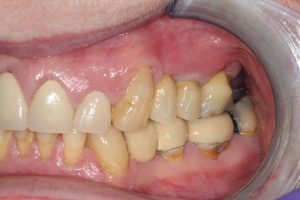 He really wanted to get rid of the denture and opted for a dental implant to replace the tooth. 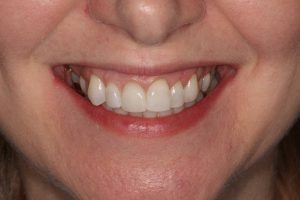 The photos below show the before and after photos with the lips retracted and a relaxed smile following completion of the treatment. 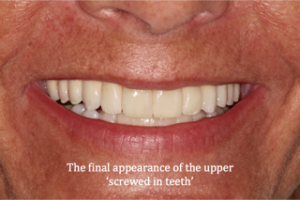 This lady had a number of spaces which were originally filled with a flexible denture. 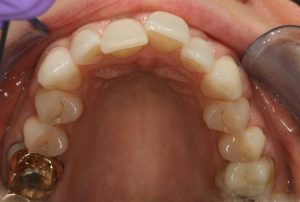 The denture (seen in the bottom right image below) was stable but she wanted to replace the denture with dental implants to improve the sensation in her mouth. The implants were placed as a staged process, 2 on the right side and one on the left. 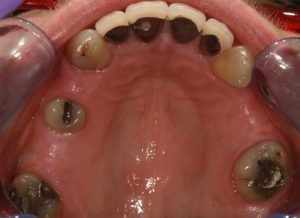 The space on the left was a little small for 2 implants but in this situation, it was possible to attach 2 teeth (a bridge) to the one implant. 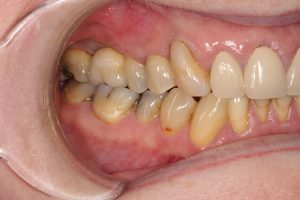 The crowns on the upper front teeth have not been replaced. 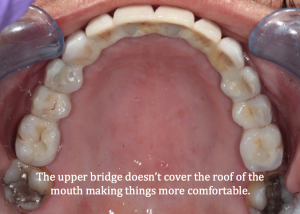 The roof of the mouth is now open, which is healthier for the gums, and the patient has much more confidence. Sometimes a perfect smile isn’t always what it seems! 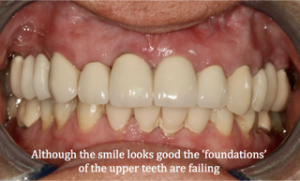 In some cases, people have had extensive dentistry over many years that can superficially look fairly good. 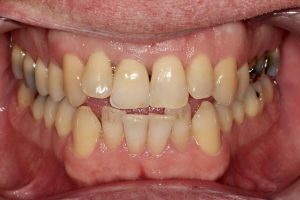 Although it may appear to be a perfect smile, the foundations of the teeth may be crumbling, causing catastrophic failure or pain. 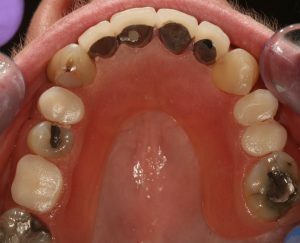 As a result, it can sometimes be necessary to consider a more drastic approach and possible removal of a number of teeth. 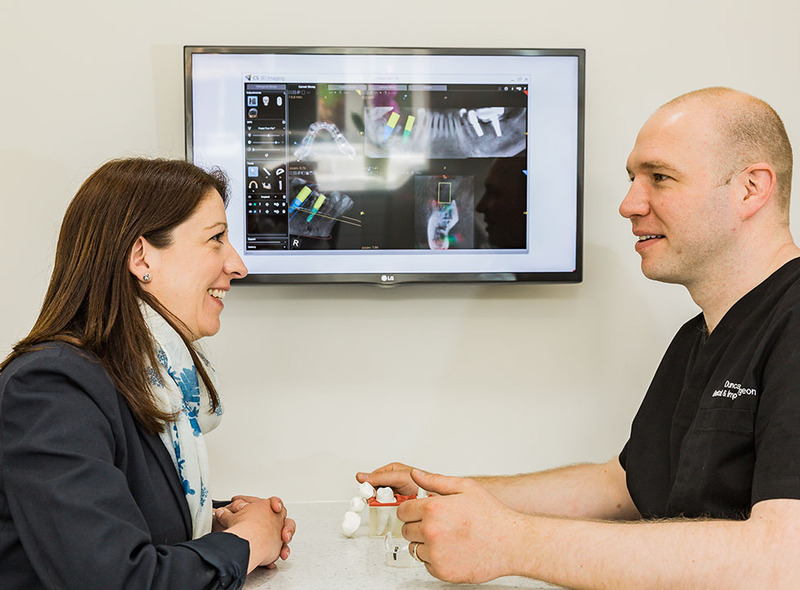 Could implants be the solution? 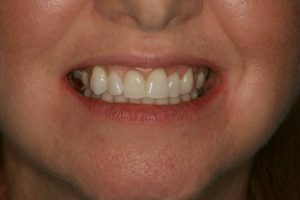 The patient, in this case, was referred to Green Square Dental by her dentist as a number of her teeth were failing. 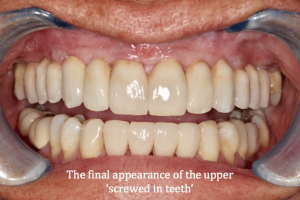 After a careful examination and detailed discussion, it was decided that the majority of the upper teeth needed to be removed as the ‘foundations’ were compromised. 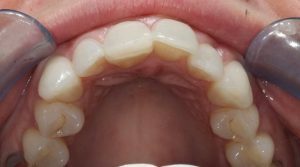 Option one would be to have an upper denture that would cover most of the roof of the mouth. 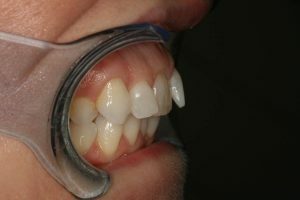 This is a cost-effective way of replacing missing teeth but they can move around when eating and can be uncomfortable. 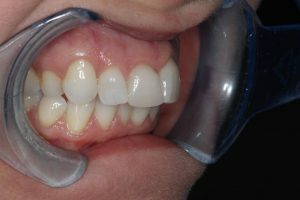 Some people can tolerate a denture very well but others would like to replace them. 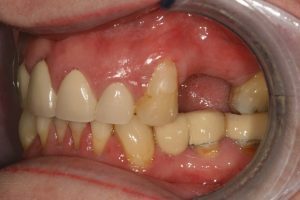 Option two would be to replace the teeth with an implant retained bridge (screwed in teeth). 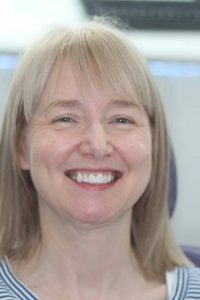 Implant treatment is generally considered to be the best way of replacing missing teeth as it gives a fixed aesthetic and comfortable result without anything covering the roof of the mouth. There is an increased investment and a considerable amount more work involved but the final outcome is worth it. 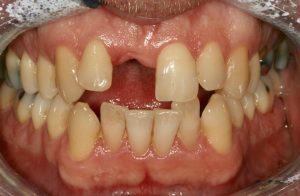 Once the patient’s teeth were removed it was necessary to place 6 implants in the upper jaw. 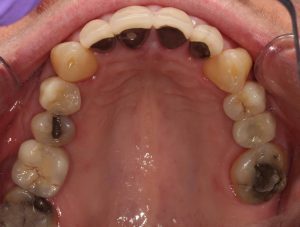 A custom made milled bar is manufactured to screw onto the implants and is covered in porcelain to look like natural teeth. 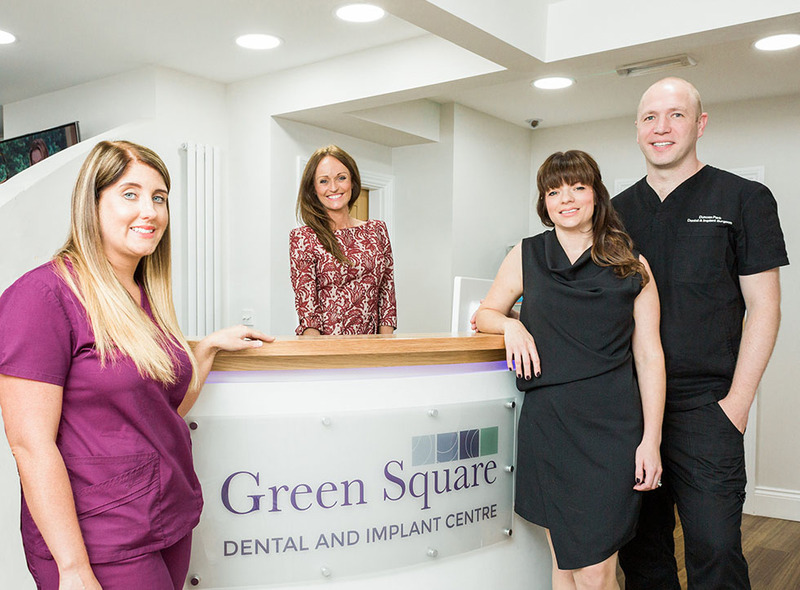 Replacing teeth with implants can make a massive difference to everyday life. They give a more comfortable situation allowing you to eat what you want rather then what you are able to eat. 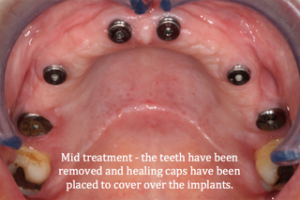 Implants give more you more freedom and much greater confidence. 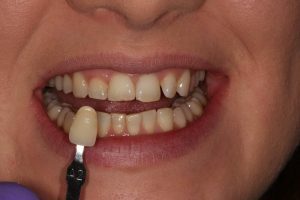 A veneer (thin piece of porcelain carefully and artistically made by a dental lab) added to the front of the tooth can change the colour and shape of a tooth. 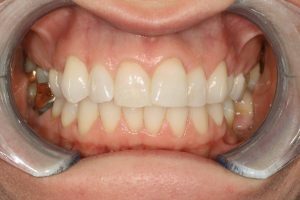 This can massively improve your smile and overall confidence. 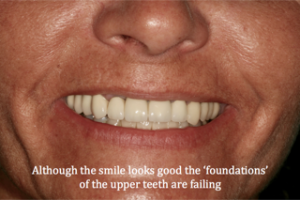 A single tooth that is crowded and pushed back can really affect the smile. In this case even though the front teeth were all the same shade the shadowing on the front tooth which is pushed back made it look darker. 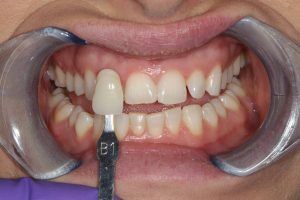 A single veneer was bonded to one of the front teeth and there wasn’t even any need to prepare the natural tooth but it makes a huge difference. 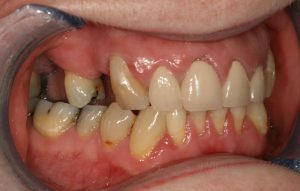 This patient came into the practice conscious about the colour of her teeth. 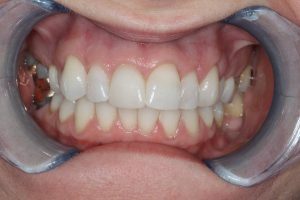 Using a home tray whitening kit we managed to get her teeth colour from A2 to B1 in just two weeks.